Earlier Pagets of Knockglass discovered! I found and copied out Deed 169-116-112988 when I was in Dublin last year, but have only just got around to incorporating the new information into the Pagets of Mayo story. It’ll take a bit longer before it gets incorporated in my family tree. 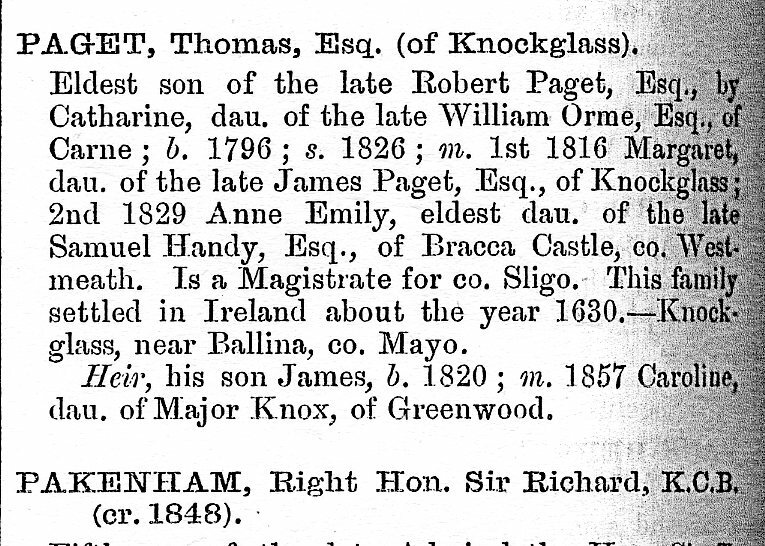 Henry Paget of Knockglass “did thereby deed, assign and make over” Knockglass and all his real estate in Co. Mayo to his nephew Thomas Paget (c1715-c1791) of Fahy in 1754. In return Thomas was to pay Henry an annuity of 13 pounds and 10 shillings for the rest of Henry’s life. 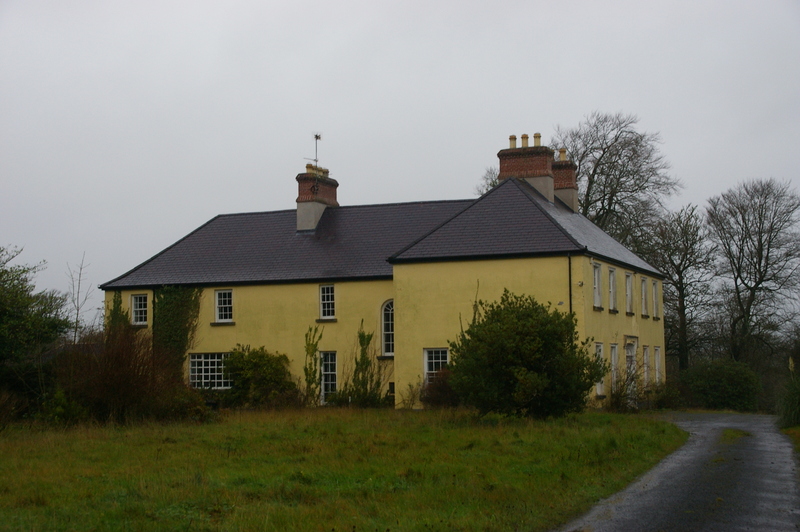 Thomas’s own address at the time was another home of the Mayo Pagets, Fahy House. In the deed the surname is spelled Pagett. I’ve updated my tree in Ancestry with the new information, and am a bit startled to discover that there are now about 6 other trees with the early generations of Pagets – I think mostly derived from mine. When I made my tree there was nothing about them at all! Maybe they’re not so forgotten after all. 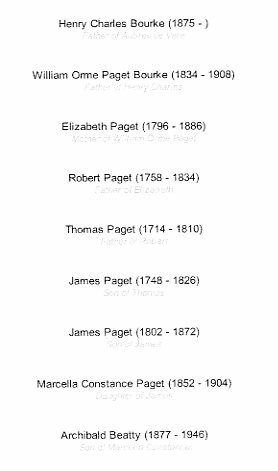 A couple of the trees have added the information that the father of above Thomas Paget, and therefore the brother of above Henry Paget was a Robert Paget. No source is given for this information although it could well be the case. Thomas’s father probably lived at Fahy too. If anybody knows a source, please let me know. Knockglass House to be auctioned! UPDATE 20-2-13 Sold at auction: see comments. So what did I find out about the Pagets after two weeks of hard work? Well on the male side our Paget family tree now goes back two generations further than gentleman James of Kinard Lodge (1803-72). I have discovered that he had two brothers who didn’t live to adulthood and four sisters who did, one being another Marcella. They all seem to have been born at Knockglass House. His father James Paget of Knockglass (1749-1826) was a very conscientious father. For each of his four daughters there is a document at the Registry of Deeds making sure she will be well provided for if she should outlive her husband, and two of their marriages were important enough to be mentioned in Burke’s or Walford’s. One of the missing marriages is his own though. None of his children were born until he was fifty. The mother of two of them is Margaret Cummins, her name appearing after his in the birth entries in the Crossmolina parish register as though they are not married? Surely they must have been though for his daughters to marry so well. Was she the mother of all his children including our James? They were a very in-bred lot. James of Knockglass’s younger brother married Catherine Orme, his Aunt Margaret had married Edward Orme, his grandmother (I think) was Margaret Orme and his youngest daughter Marcella (the Aunt of our Marcella) married another Edward Orme. If there wasn’t an Orme to marry they even married each other. His eldest daughter Margaret Paget married her cousin Thomas Paget. The most annoying missing marriage is the one I was determined to find between James Paget and Hannah Dempsey and I’ve looked everywhere. James was definitely married in 1829 to Catherine Benson though they seem to have been childless. I think I mentioned in a previous post the document I found at the Registry of Deeds dated 1849 between James Paget and Charles Benson which I (very roughly and possibly wrongly) translate as “I’ll give you a couple of Townlands if you’ll take your daughter back”. Opinions are divided among the experts I’ve consulted here as to whether James would have been allowed to marry again with a living wife. Divorce as such wasn’t recognised then though I’m told “There were ways and means”. He certainly made up for lost childbearing time with Hannah, married or not. Our Marcella was the eldest of five. In short I found out both much more and much less than I had hoped. Half an answer leads to two more questions. No wonder people who get sucked into family history spend the rest of their lives at it! Anyway I think I’m over the Pagets for the time being. If I come back to Ireland I’ll try the Beattys. Very eventful day today. Firstly I’ve discovered a descendant of Alf Beatty (or rather she discovered me) who has more photos that are sure to help us identify the whole James Beatty family. More next week. Since I now know that our James Paget is the son of James Paget of Knockglass, Crossmolina, I drove over there this afternoon and got soaked scrambling around the churchyard of St. Mary’s looking for the Paget graves. The old part of the churchyard is an overgrown, slippery mass of roots, stinging nettles and broken and indecipherable headstones. 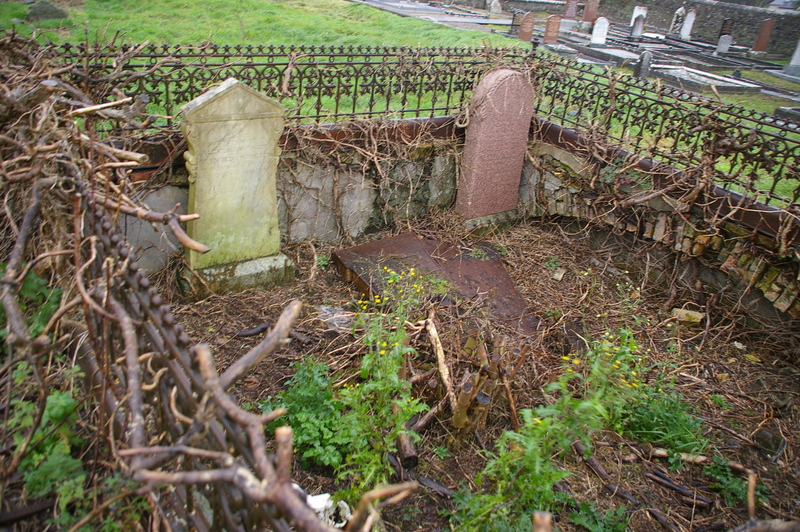 Two of the Paget headstones had collapsed on their faces, and despite being fit from weightlifting “tombstones” at the registry of Deeds I couldn’t shift these. The standing ones are descendants of James’s cousin Thomas Paget. Determined to find Knockglass House where James Paget junior was born in about 1803 I drove up and down several narrow muddy lanes until a kind farmer told me to keep driving past a ruined gatehouse for about a mile through a dense, ragged forest labelled “Game reserve”, pretty much the first actual forest I’ve seen in Ireland apart from some pine plantations. 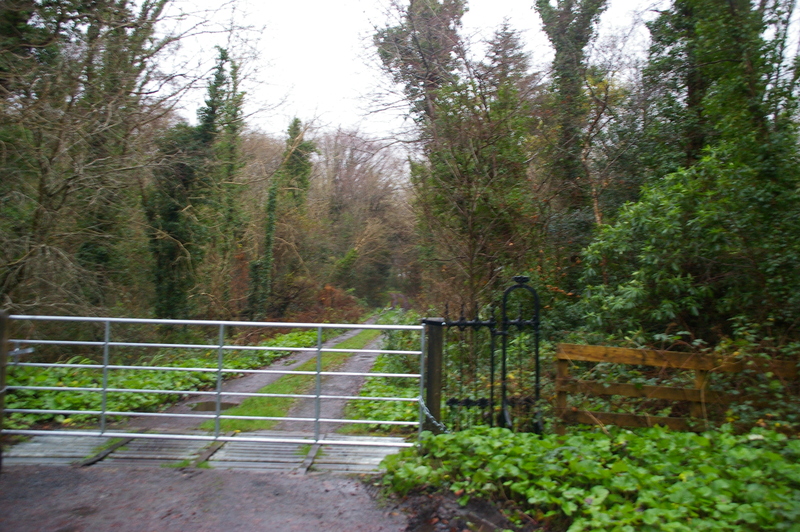 It seemed a most unlikely drive for a substantial home, and after about three quarters of a mile there was a very new and businesslike locked gate. I later learned that it is for sale. I drove back through Ballina where the main streets probably haven’t changed all that much since the Beatty family lived there, the River Moy practically running a banker through the middle of the town. Too tired to take more photos, camera, car and shoes all very wet and muddy, I went home to Enniscrone to dry out. It gets dark by 4.30 here anyway. Back to Dublin tomorrow.